The Poster Competition was sponsored by the Protein & Peptide Science Group of the Royal Society of Chemistry. There was a prize of £100 for the best Poster with two runners-up prizes of £50 each. 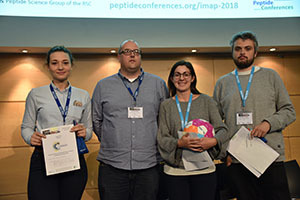 Congratulations to Lucia Grassi, University of Pisa who won first prize for her poster "Testing the effectiveness of antimicrobial peptides in physiologically relevant models of biofilm-related infections." Also to the two runners-up: Philip Ferguson, King's College London and Tatiana Zyubko, Skolkovo Institute of Science and Technology, Moscow. The prizes were presented by Prof. Steven Cobb, Secretary of the Protein & Peptide Science Group. 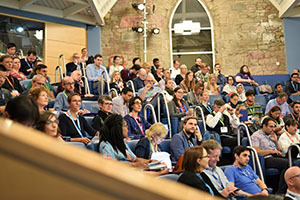 IMAP 2018 is organised by Peptide Conferences under the auspices of the Protein & Peptide Science Group of the Royal Society of Chemistry. For more information about other meetings visit the main Peptide Coferences website. Return to the IMAP 2018 homepage.